Andrea Lunsford’s research shows that students are writing more than ever — in classrooms, workplaces, and social spaces, in local communities and around the world. The Everyday Writer, Fifth Edition, is the first tabbed handbook to help the participants in this "literacy revolution" build on the smart decisions they make as social writers — and use their skills in their academic and professional work. 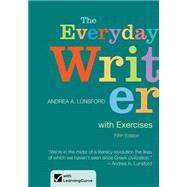 With Andrea Lunsford’s trademark attention to rhetorical choice and language, and with new chapters on public writing, critical reading, and understanding how and why to use documentation, The Everyday Writer gives today’s students the information they need to be effective, ethical writers. New illustrations by graphic artist G.B. Tran make complicated concepts clear and inviting for students. And now LearningCurve, game-like adaptive quizzing, gives students a new way to see what they know. Andrea A. Lunsford is professor of English at Stanford University and also teaches at the Bread Loaf School of English. A past chair of CCCC, she has won the major publication awards in both the CCCC and MLA. For Bedford/St. Martin’s she is the author of The St. Martin's Handbook, Seventh Edition, The Presence of Others, Fifth Edition, and The Everyday Writer, Fifth Edition, as well as the Sixth Edition of both Everything’s an Argument books.